Robinhood’s offering is unmatched: Commission-free stock and ETF trades. In exchange, the app lacks extras like research or trading tools. The Bottom Line: If limiting costs is your No. 1 concern, Robinhood is a solid choice. Robinhood is a free-trading app that's ideal for investors who want to trade stocks, options, exchange-traded funds and cryptocurrency without paying commissions or fees. The service is innovative, cutting out nearly all costs that are typically associated with investing. But as always, there's a tradeoff to free: Though Robinhood offers both web and mobile trading, the platforms are purposely bare bones, and some investors may find the range of tradable securities and account options lacking. » Want help managing your investments? See our top robo-advisors. Frequent stock, options or ETF traders. Commissions: This is obvious: What’s better than free? Robinhood’s commitment to providing 100% commission-free stock, options, ETF and cryptocurrency trades is admirable, and the savings for investors who trade frequently is significant. After all, every dollar you save on commissions and fees is a dollar added to your returns. » New to investing? Learn more about how to buy stocks. Robinhood also seems committed to keeping other investor costs low and took a big step toward doing so by launching Clearing by Robinhood last year. The service allows Robinhood to operate on its own clearing system, which reduces many of the service's account fees. For example, broker-assisted phone trades that were previously $10 are now free, and bank reversal fees were reduced to $9 from $30. Ease of use: If you’re accustomed to using a smartphone — and Robinhood's target user base obviously is — you’ll find the sign-up and account funding process quick and painless. It all happens within the app in a matter of minutes, with just a few quick questions that gather your personal information, contact details, Social Security number and means of funding your account. The company says approved customers are notified in less than an hour, at which point they can initiate bank transfers. Robinhood uses instant verification with many major banks, sparing users the hassle of reporting micro-deposits to an account to verify information. Bank transfers of up to $1,000 are available instantly for investing, as are proceeds of up to $1,000 from selling stocks. Deposits larger than $1,000 will take four to five business days to process. Users can set up automatic deposits on a weekly, biweekly, monthly or quarterly schedule. Streamlined interface: This could be a negative, as the service doesn’t offer all the bells and whistles of a typical online stock broker. But for investors who know what they want, the Robinhood platform is more than enough to quickly execute trades. It supports market orders, limit orders, stop limit orders and stop orders. Both the mobile and web platforms also include a feature called collections, which are stocks organized by sector or category. Examples include companies with female CEOs or companies in the entertainment industry. On web, collections are sortable and allow investors to compare stocks side by side. Robinhood also recently introduced a new tab bar at the bottom of the app, which offers quick access to portfolio values, watch lists, transaction history and account statements. Robinhood Gold: Robinhood Gold offers investors the ability to trade on margin, also known as borrowed money. The opt-in service carries a flat monthly fee based on margin — or “buying power,” as Robinhood calls it — and account size. Improved research offerings: Though Robinhood's offerings still pale in comparison to other brokers, the company has made strides to increase the tools and research available for customers. Robinhood offers analyst ratings from Morningstar, an independent investment research company, as well as lists of top movers, earnings calendars and links to earnings calls. Candlestick charts are now available on mobile, and the service resurfaces information from other Robinhood customers in an Amazon-like fashion: Investors can view current popular stocks, as well as "People Also Bought" and "Price Paid" (though "Price Paid" is currently only on web). Limited securities: Mutual funds and bonds aren't supported. Robinhood also lacks an automatic dividend reinvestment program, which means dividends are credited to accounts as cash rather than reinvested in the security that issued them. The company has said it hopes to offer this feature in the future. 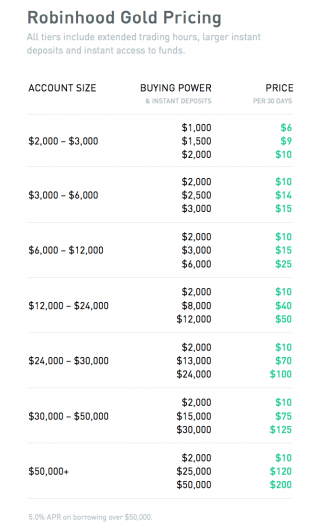 One account option: For investing, Robinhood supports only individual taxable accounts (often called brokerage accounts; you can learn more about these accounts here). For most investors, investing through a taxable brokerage account should come only after they have invested 10% to 15% of their income for retirement in a tax-advantaged account like a 401(k) or IRA. » Looking for a retirement account instead? See our roundup of best IRA account providers. Customer support: Many brokerage customers understandably expect phone support, and they won't find it here — Robinhood's customer support is almost exclusively done through email. The company does not publish a phone number. It does have a useful and well-organized help center online, and the website is easy to navigate and transparent. Is Robinhood right for you? "Free” often just means the extra fees are buried deep where you can’t find them, at least not until they show up as a surprise addition to your account statement. Robinhood is refreshing because the service is truly free: You can trade without spending a dime in fees or commissions. You’ll give up a few things in exchange — namely advanced trading tools, notable research, education and the full range of investment options — but if limiting costs is your No. 1 concern, Robinhood is a solid choice. Interested in other brokers that work well for new investors? Also see NerdWallet’s rankings of the best brokers for beginners.